A strong storm or a hurricane can cause widespread power outages. The company’s electrical system has a variety of devices to detect outages when they occur. 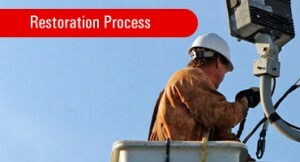 Our restoration teams always work hard to make your outage as brief as possible. Stay away from all downed wires. Even if you think they may be phone or cable television wires, stay away from downed lines. Don’t step in nearby puddles or attempt to move any object that comes in contact with a wire. 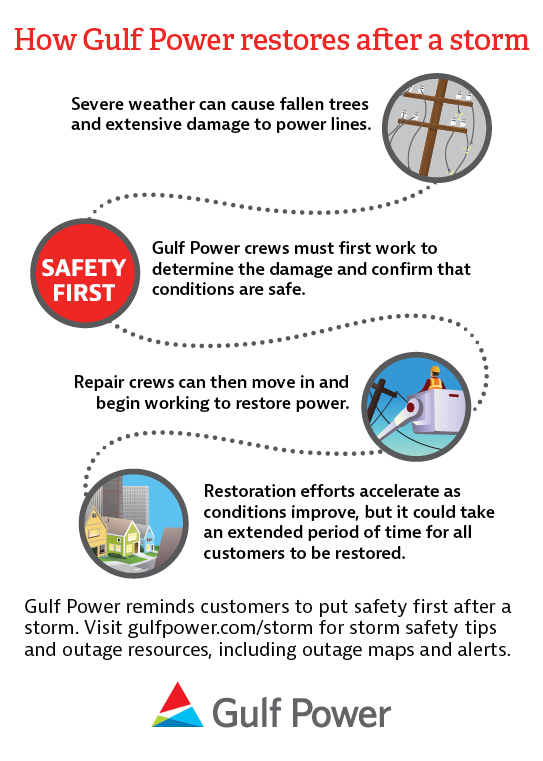 Report downed wires immediately to Gulf Power and your local public safety authorities. We also safeguard our employees. We do not ask them to make repairs when weather conditions are hazardous or when the damaged area is dangerous due to flooding or inaccessibility. In such extreme situations, we ask for your patience and understanding. Our employees will begin restoring power as soon as safely possible. Our dedicated restoration teams are working hard to restore your power. Our crews are highly trained and nationally recognized when it comes to restoring power. When a major storm strikes, we bring in crews from other areas to ensure you get your power turned on as quickly as possible. We typically stage crews and supplies in areas with the most damage and greatest need first to speed restoration and to quicken response time. Getting the power back on in a fair, efficient manner. Gulf Power concentrates restoration efforts in the areas and on the power lines that restore electricity to the greatest number of people in the shortest time. Emphasis is placed on vital community services such as hospitals, emergency services and public safety and water and sewage stations. Because we cannot predict when your service will be restored, we suggest that you make arrangements for persons with serious medical problems or other disabilities to be moved to another location where service is available, until power is restored. We do not make restoration priorities based on where your home is located, your credit history with us or how often you call us to report the outage. How the restoration process works. We start at our power plants and work first on the large lines going out to the communities from the plant. While working on these main transmission lines, focus goes to the next largest lines – the main feeders or distribution lines in a community, along with restoring power to essential services such as hospitals, water and sewer plants and fire and police stations. Next we repair damage that will return power to the greatest number of customers in least amount of time. After these are repaired, smaller lines are repaired until the crews get down to the individual lines in neighborhoods.